Do you have more glitter and sparkle in your interior decorating tool kit than a fairy godmother or does the idea of shimmer and shine in your shrine turn you into a wicked stepmother? Whether you are the diva of dazzle or the damsel of dull, the secret to creating a home fit for a prince and princess lies in the magic of moderation. Whether it’s a gem-encrusted sunburst mirror, a grouping of luxurious cushions in metallic fabric, a crystal chandelier or embroidered and embellished upholstery, allow it to bask in, rather than compete for the spotlight. The best way to achieve this drama is to create a tastefully and resolute décor theme and palette to serve as the canvas upon which to adorn a sparkly work of art. Choose to paint walls and upholster your big expensive pieces of furniture in neutral tones, then dress the room with just the right amount of bling. “When it comes to window treatments keep in mind that curtaining in rich luxurious textures and colours may look stylish when opened and gracefully held back with ornate tiebacks but when drawn the effect is completely altered; a lady with class becomes the crass lady of the night,” says Karina. Blinds are considered fixtures, so they add real value to the home and the decorating scheme. AMERICAN shutters’ wooden slat blinds are low-maintenance and durable; their higher dimensional stability resists cupping, twisting and warping and the timber used is naturally resistant to decay and is a great thermal insulator. With more than 50 stain and colour finishes to choose from, a choice of slat sizes and a range of valances, wooden blinds can themselves be the belle of the ball. “We also offer some bling, with the option of fabric or decorative tape running down the face of the blinds to cover the ladders,” says Karina. 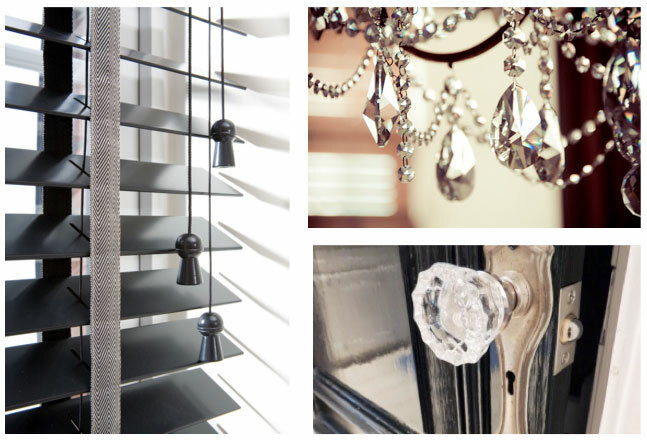 Perhaps the best reason to install blinds in a room designed to sparkle is their unrivalled versatility. After all what good is it if there is no light to spark the purpose of all that glitters? By opening the louvres or pulling the blinds back completely, maximum light is allowed indoors, perfect to reflect off chandeliers, crystal glasses and mirrors. So when next you dig into your tool kit of sparkle and glitter, be sure to take the advice herein and prevent your carriage from morphing into a pumpkin.